We have selected the very finest products for this whisky gift. 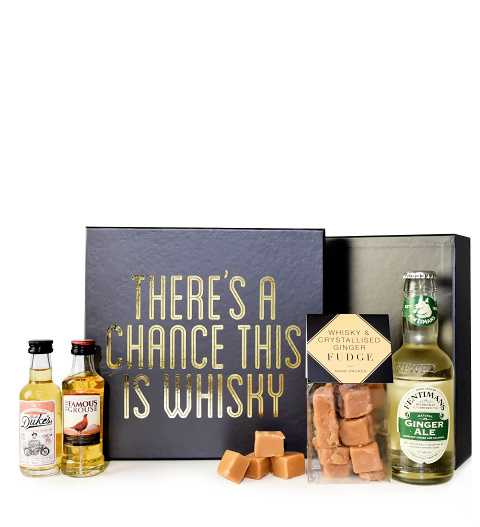 With two bottles of whisky, refreshing ginger ale, and delicious ginger fudge, this gift will make those taste buds tingle! Suitable for all occasions from birthdays and anniversaries to congratulations and everything in between. Spoil your whisky-drinking loved one today with this luxurious gift. Allergy Advice: This gift contains some items which contain milk. Also not suitable for customers with an allergy to nuts & peanuts as some products were made in a factory which uses these ingredients.